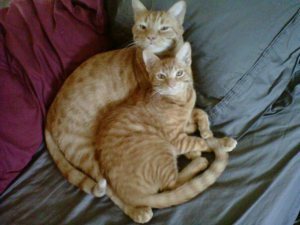 I still miss Hobbes and Cheddar. If you have a cat (or more than one cat), the chances are that you have litter at least one litter box (one good ‘rule of thumb‘ for these is to have 1.5 boxes for each of your feline friends). Most people I know use clumping litter. If you know how it works, it may make little sense to dump your litter down the toilet. The reason for this is simple; litter turns into concrete when it comes in contact with water. This actually happened to me so this is a good way to deal with litter in the toilet. Well, that sucked so I went online and looked for DIY solutions. I found one. It suggested using liquid Joy (lemon). I spent the next six hours pouring the dish soap into the toilet with warm (not hot) water, plunging, waiting about 30 minutes and then repeated it about every 30-60 minutes until the toilet was completely clear. I cannot promise this will work for you but it worked for me. This entry was posted in Personal stories and tagged 3D printing, Alan Turing, Arduino, Associated Press, Bin bag, Board game, Boot, Cat, Litter box, Toilet on January 30, 2016 by Alyson Chadwick.